‘Just when you thought Ryanair’s Michael O’Leary chief executive couldn’t make a bigger prat of himself, he manages to up the ante. This time, by quite a some considerable margin. “Nobody can argue that there isn’t climate change. The climate’s been changing since time immemorial. Do I believe there is global warming? No, I believe it’s all a load of bulls**t. But it’s amazing the way the whole f**king eco-warriors and the media have changed. It used to be global warming, but now, when global temperatures haven’t risen in the past 12 years, they say ‘climate change’. It’s pretty clear that Michael O’Leary is a very opinionated man. 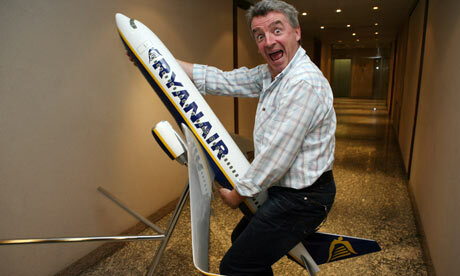 As cost-effective airline Ryanair’s CEO, he has used his position to slant any and all ecocentrics rather brashly. His position is very anti-ecocentric, leaning more towards anthropocentric (although he is quite rude and doesn’t appear to like most people). I think we can all agree that one thing is for sure – Michael O’Leary is no eco-warrior!